At 6 am on Tuesday mornings, my hands are rested. Restored to their natural pinkish-tannish color by lotion and washing and care, they aren’t quite ready to dig back into the crumbles of Walla Walla valley soil that cover the 8 acres of Hayshaker farm. Clipped on Friday and maintained through the weekend, the nails are almost dirt-free. The skin is softer than at the end of the week but maintains a couple of blisters close to the palms. The mornings start with harvest and my hands have a pretty strong opinion on the matter. Wednesdays and Fridays begin with cukes and zukes, harvested by serrated knife through spikey stems. Leaves, flowers, stems, and fruits are covered by fine hairs that rub just the right way to leave painful scratches on hands and wrists. (Although after my life-changing discovery of gloves, my hands do not complain nearly as much). 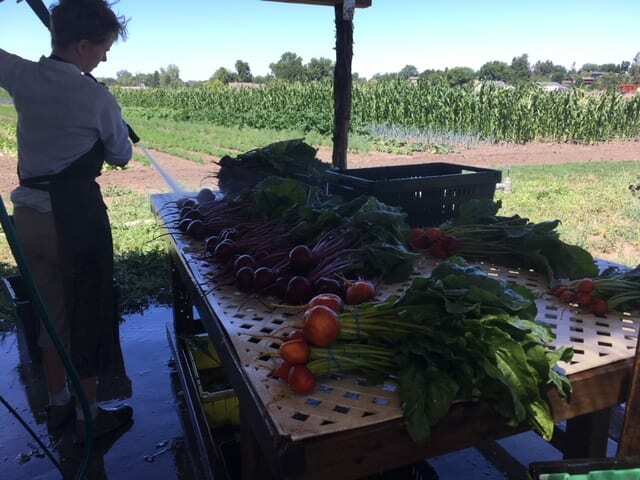 Tuesday and Thursday mornings are easier on the hands, and are usually marked by salads and greens: rainbow chard bunches and mustard green harvests are cool and wet and fill crates easily. If I am lucky, a morning will end with the collection of anise hyssop, sage, thyme, fennel ferns, and salad Burnett all tossed in with the greens to make the salad mix, leaving my hands smelling like a mixture of licorice and a Simon and Garfunkel song. On days when tomatoes are ready, hands come away coated in a greenish-blackish crust that forms to the cracks in the skin and sticks even under soap and water. After harvest, the hands set to work killing plants and making blisters. Worn wooden handles of hoes and hand tools feel soft at first, then get to rubbing at the palms while killing the weeds that pop up between rows and within plants. 600 ft rows make for leathery palms and happy tomatoes. 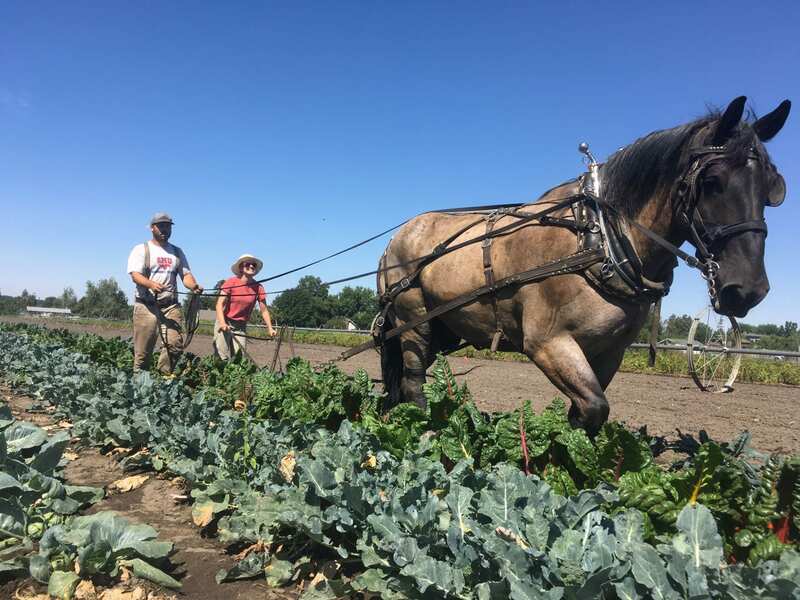 The three horses that work on the farm, Dusty, Jackson and Filbert, help pull plants with a cultivator tool built as early as the 1930s. It’s metal handles are gentle on the hands, which push down to propel the opposite side of the tool to steer. Built for a smaller person, my hands push down easily but still tire after a few rows churning up the ground to cover weeds between potatoes and lettuce. A similar tool with wooden handles and a large triangular plate underneath flattens dirt between rows and hills it up on either side to support the stems. My coworker Josh holds the leather reigns while I steer the tool to knock down all of the amaranth and purslane possible. At the end of the day, however, there are certain weeds that wrap around stems and hide under leaves. Those can only be reached while on your knees, hands digging through topsoil to clean the rows. “Our dirt here is sticky” is a sentence and truth that comes up often around Hayshaker. Looking at the carrots, beets, garlic and small ridges on the outside of my pointer finger, I would have to agree. Although dry and rocky on the top layer, this soil graduates to a dark, sticky humus a foot down that clings when wet to new potatoes and work boots alike. This soil transforms hands. It will be what I find under my fingernails and in my palms weeks after I forget the smell of newly pulled garlic and the heat of the Walla Walla sun on my neck.